Good result, why do people still stuff as untested that then it's broken? Because if they are untested, do you think maybe work and is cheap. But if you see It Broken, directly you don't buy It. That's not always the case. I've bought may untested stuff that worked fine. And some "working" that did not. I am interested in the cable you use to connect the GX4000 video input to the CPC monitor. Did you build it yourself ? I've just done a RAM swap for Shaun. 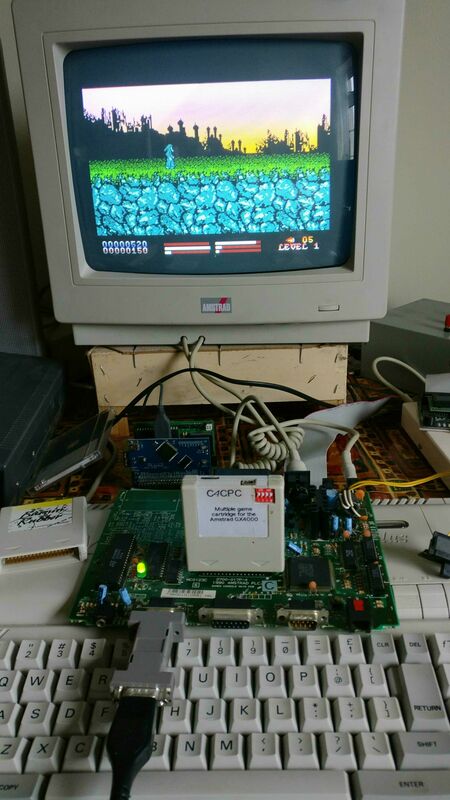 His gx4000 is now working fine using loan RAM from my speccy +3. 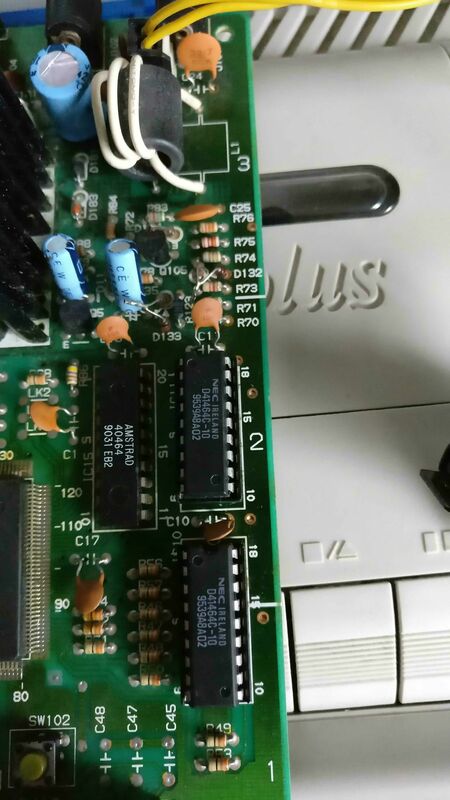 Was about to post this, but Craig beat me to it as that's my formally dead GX4000 board in Craig's capable hands. I had to send it to him after I nearly made a hash of the contacts trying to desolder the RAM (I'm actually not that bad, but my iron is a pile of crap), and to his eternal credit, he's done a fine job. But we wouldn't have had a starting point if it wasn't for yourself, Gerald. So thank you. I feel I should mention something else I found after replacing the RAM (a few days later). I think I may have been lucky with my fix in that I use a 5v power supply and run it off the CTM monitor. If I had used a larger supply (9v) in the other socket, I may have blown the RAM again (or worse). After re-reading the above post, I tested the protective diode that Gerald mentioned... D183 on the board (near the voltage regulator with the heatsink). It appears mine is testing as shorted, therefore it would be doing nothing (no protection). Running on 5v only is fine, as all the circuitry is 5v anyway, but beyond that I might have been in trouble. Just thought I would mention this to anyone looking at fixing a 'dead RAM' GX400, as my assumption with these is that somewhere along the line, someone has used either a faulty GX power supply or simply a wrong voltage supply (or in the wrong socket). And I'm also going to assume that if the RAM is fried in this situation, there is a good possibility the Diode is also taken out. I would say it is well worth testing the diode as part of the RAM swap. Upon reading that initial post, I'm under the impression that 9v and 2.2-2.5a (in the 11v socket) is fine if you wish to run it off SCART or CPC to SCART socket, as 6-7v is too low to power it on standalone. The original Amstrad Power Supply was too much, and on top of that, complete rubbish to begin with caused many a fried RAM, with or without a C4CPC. I know Craig's one runs off a 9v and he's had no problems either. Yes, if the GX4000 is in normal working order then 9v (Only plugged into the 11v socket) is perfectly fine. What I am indicating, is that if you have the situation like we have just encountered where the RAM is dead, then also check the protection diode D183. If, like in my case this is shorted, then plugging the 9v into the correct 11v socket would also cause the 9v to go across to the 5v circuitry. Basically, it would be just like plugging the 9v into the 5v socket. The 5v regulator drops the 11v (or 9v) down to the required 5v if all is operating correctly. As can be see from the schematic in Geralds post, a short on that diode would basically bypass the the 5v regulator. If the diode is working correctly then it will 'block' the voltage in that direction, basically forcing it through the regulator. Given how awful the power supplies that came with the machine in the first place, Christ only knows what damage they did to the boards and their respective components every time the thing was turned on. 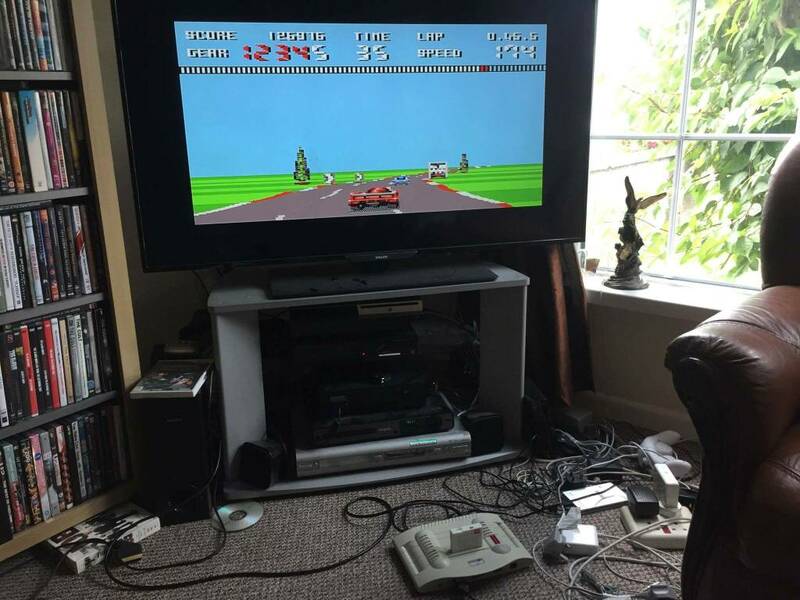 I've even heard some horror stories about them frying consoles when you connected them to said power supply at the back while the power switch was accidentally on instead of off. Just out of interest. How are you guys measuring the diode D183? In-circuit? Removed? In both directions? If the diode is completely shorted, then using even a 5V supply could damage your GX4000 if the diode isn't replaced. I measured the diode using the diode tester on my multimeter, initially in circuit and then out of circuit. Tested in both forward and reverse bias directions, both directions reading 0v on my meter (short), and this was the case in and out of circuit. The new diode, tested out and in circuit, tested ~.5v forward bias and OL (open) reverse bias. Voltage on both sides of the voltage regulator was ~5v. What would 5v potentially kill with that diode shorted ? If the diode is shorted you are essentially bridging the 7805 which ensures a perfectly regulated 5V rail. So if your 5V PSU is at 5.4V or is full of spikes, ripple noise and dirt, then all this is getting directly through to the 5V components. Yep, regulated 5v supply into the 5v socket. Yup, and I'm on my third coffee at this stage. If I did not have to dismantle the speccy +3 to get at some ram chips I'd test the 9v power now. 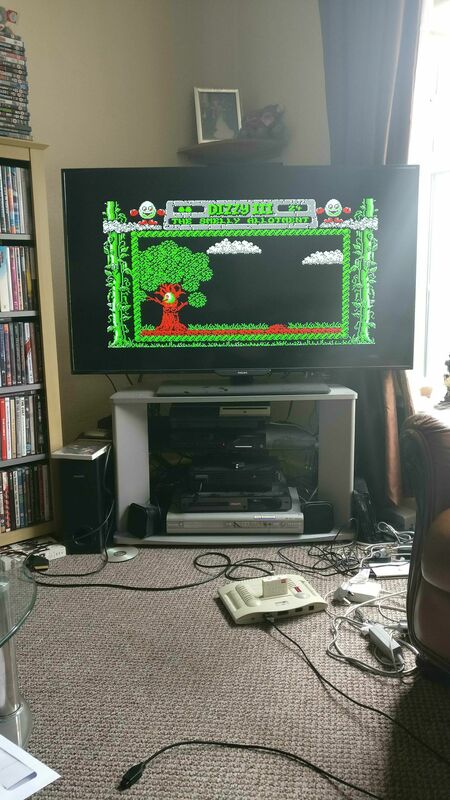 All tested and working.... Albeit with the suspect speccy +2 ram. lower rom using XMem? I am using "exrom.bas" from XMem tools disk A, and then it shows that ROM 0 = 64, ROM 1 = 01, and LOWER ID = 71. So after "filename? " I loaded ramtest.bin, and tried all 3 IDs, but when I booted in XMem boot mode, I either got a pixelated screen or colorful vertical stripes. What am I doing wrong? I am using a 6128. After that, I have to run "setup" from XMem tools disk again, in order to get the XMem Firmware 3.14 back again, so it seems to be replacing some system roms, but it doesn't work. Thanks! When using the X-MEM and you want to install a new lower ROM (which is the case here I guess), then you can use my ROManager to install it. However it's a bit more work since you need to install FutureOS before. If you need a step by step guidance please let me know. I don't remember if the FW 3.16 Flasher RSX can also be used for this purpose, but you can try ROM number &47. Tried that, but getting pixelated screen when booting from XMem. Oh I see. The question is not to tell if Flasher has a problem or the ROM you flash. You still can try ROManager. Have a look around this area. Page created in 0.288 seconds with 104 queries.